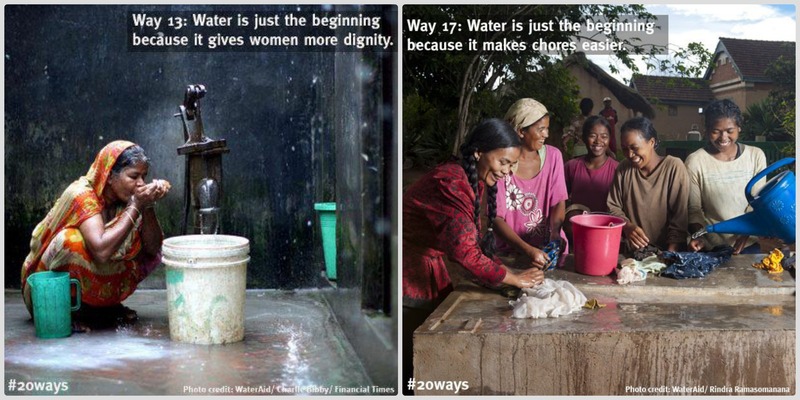 Today is World Water Day, so it seemed fitting to feature WaterAid America for Philanthropy Friday. I’ve blogged about WaterAid before. I think they are an amazing organization, and I truly enjoy partnering with them through the Global Team of 200. As I type this post, I have a big glass of clean water next to me. Clean, delicious water that I have access to by simply walking in my kitchen and turning on the faucet. In other parts of the world, lack of access to clean water means that women spend a good part of their day traveling to retrieve water. This time could be spent doing simple daily chores, cooking and providing for their family. WaterAid helps the world’s poorest people to plan, build and manage their own safe water supplies and to improve their sanitation and hygiene. Something as simple as water can help end poverty. Having clean water close to home means that families can spend more time together. They can raise livestock or start a business. Children can stay in school because they are not sick. Water is just the beginning. Watch the video to see how safe water is changes lives. 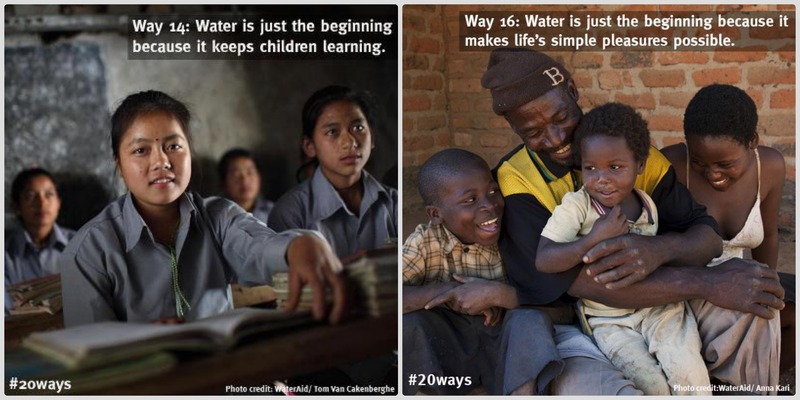 Share WaterAid America’s posts on the #20ways that water is just the beginning of the road out of poverty. Join the World Water Day Google+ Hangout at 1.30pm EST on March 22, where WaterAid and other water organizations will be discussing the world water crisis and solutions in a celebration moderated by YouTube star Justine Ezarik. Make a donation: As experts in practical, hands-on water solutions WaterAid has brought clean water to 17.5 million people. But they need your help to achieve their aim of helping 1.4 million more people this year. Visit www.wateraidamerica.org/worldwaterday for all the latest World Water Day news. Thanks, Girls. It’s crazy that women spend most of their day just traveling to get clean water for their families. Water is so precious. It’s one of the most important things to sustain life. Wonderful post. I definitely don’t take this stuff for granted. Have a wonderful Friday and I’ll tweet/share this to help others know about it. I think it’s easy to forget how lucky we have it. Thanks for helping to spread the word, Cyndi. Have a wonderful weekend! Philanthropy Friday – I love that!! So glad you decided to share about World Water Day – it’s so important! It’s amazing, isn’t it? I attended the Google+ Hangout I mentioned in the post. It was cool to see all the water-related organizations working together. Thanks so much for bringing awareness to this very important issue! Keep up the good work and thanks for celebrating #WorldWaterDay with your community! I’m happy to use my blog to bring attention to these important issues. What a day it was! Are you familiar with charity: water? I really like their give up your birthday for clean campaign. If you don’t know already you should check them out. I definitely feel very fortunate to live where access to clean water is not a problem. Yes. I was able to hear more about them during the Google+ Hangout. They are a great organization and just got a big grant from Google. Very exciting work they are doing! We are very fortunate. P.S. I love bacon and hate pie too! You are doing so much good just by writing about this issue! Raising awareness does a lot. It’s really unbelieavable that something we consider so normal is a problem for so many people. It shouldn’t be that way, there is enough to go around. I wish that as a society we weren’t so obssessed with money, then maybe we’d more things that don’t bring a profit. Joanna recently posted..Can we really have it all? It’s easy to forget about how good we have it. Something as simple and as necessary as water should be easily accessible to everyone. This one really got me because I do take water for granted – and it does save lives. I will share.